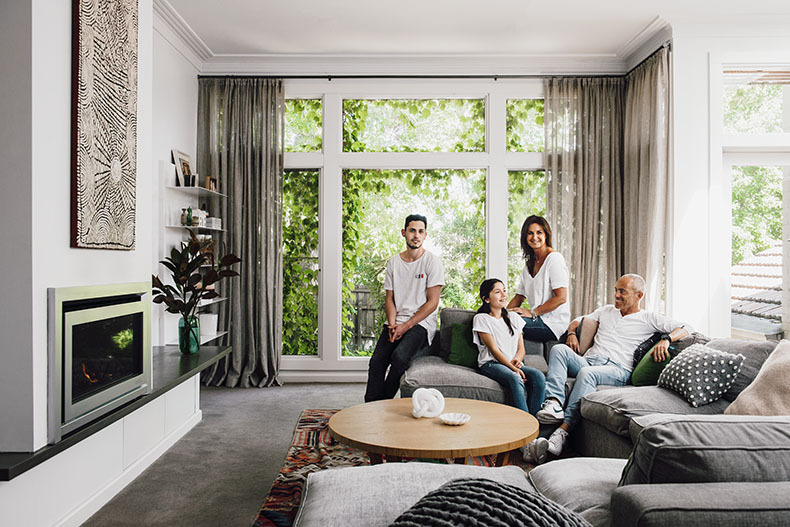 Recently interior consultant Rebecca Shnider took us through her beautiful art deco Melbourne home. If you missed the tour, you can catch it here. 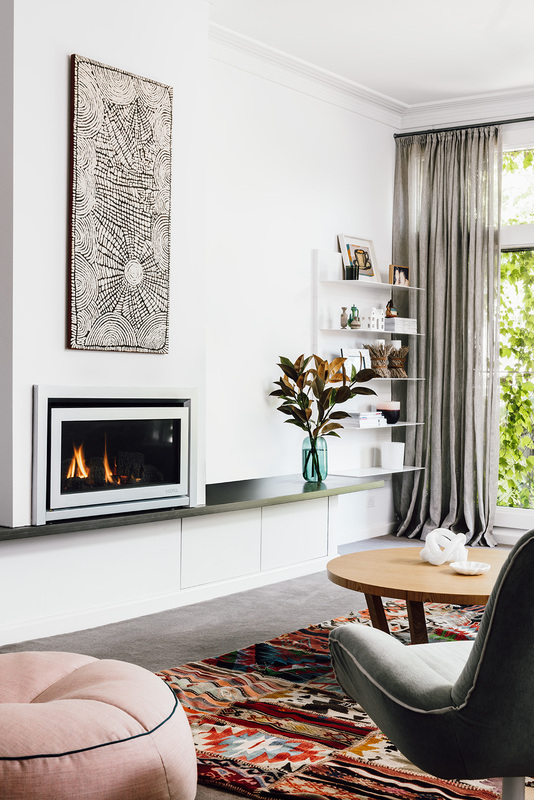 The family renovated the two storey character home a few years ago, and an Escea DL850 gas fireplace was a central part of the open plan living space design. 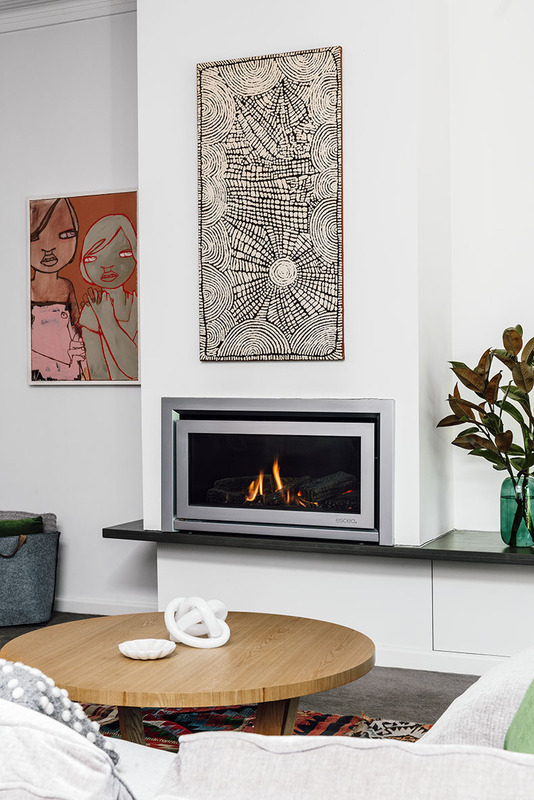 Why did you choose your Escea fireplace? Its sleek and minimalist design and the fact that it looks real and is thermostatically controlled. What made you go gas instead of wood? We love the fact that a gas fireplace means NO mess and zero maintenance. Which fuelbed did you choose and why? We were really after the most natural looking gas fireplace we could get so we chose the logs fuelbed. How does your family use the fireplace and the living room the fireplace is in? Everyone congregates in this room, fights over who’s sitting in the corners of the u-shaped couch and who’s in control of the remote for the fireplace. Of course I’m always turning it up while everyone else is turning it down. Talk us through the install and design: Being an older home the balance between new and old had to be perfect. We wanted the fireplace to blend in well with the rest of the space, which is open. We kept the fireplace surround the same colour as our white room walls, and added a hearth beneath the fireplace that acts as a shelf for our TV and home accessories. So as well as looking really good, this is practical as it’s a great use of space. The AV equipment is able to be hidden away into shelves beneath the hearth. Another selling point for Escea was the fact that they have the innovation to keep the wall cool, which means you can put art and TVs above the fireplace. In this case I have gone for the unconventional choice of putting a kilim rug above the fire! Finally, who is the ‘fire hogger’ in your family? My husband is definitely the fire hogger in the family. He thinks it’s the best position to stand in front of it so he can talk to everyone while they’re on the couch. The dog Charlie also loves lying in front of it late in the evening.